Above shows the newer HDS-Mk-II on the left next to the older HDS-455 Mk-I on the right, both boxes are exactly the same height but the drivers and crossover have changed. This photo distorts the perspective a little, the mid/bass drivers are exactly the same size between the Mk-I and Mk-II. Both of these speaker boxes have been modified by Hux. 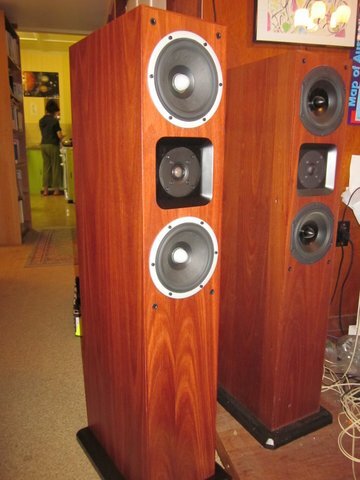 These floor standing speaker boxes are quite simply breath taking when set up properly. They were designed by Russell Story of Stone Sound Studio (who also trades as Artisan) specifically for WES Components (Wagner Electronics). The rear ported cabinets come pre-assembled and are professionally constructed, the drivers are made by Peerless of Denmark, the tweeter is recessed in the cabinet and is time aligned with the mid/bass drivers, the custom crossovers use non inductive resistors and high quality Solen brand capacitors and inductors. Each loaded cabinet weighs around 30Kg, the base of each speaker box contains a cavity that can hold an additional 20 Kg of sand ballast for those who require it (not really needed). Black vinyl or Jarrah timber finish. The original HDS-455 Mk-I has a couple of audible quirks that I have cured by adding a Zobel filter in the mid/bas and a gentle LCR notch filter in the HF, I have also adjusted the tweeter level slightly. 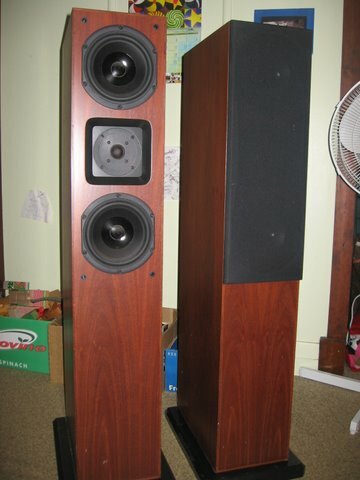 These speakers are outstanding with these modifications in place. The HDS 455 Mk-II has just one audible quirk and only requires a very simple modification to bring it into focus. The MK-II has a slightly different flavour to the Mk-I, both are outstanding when modified and fully run in. I you already have a pair of these fine speaker boxes (Mk-I or Mk-II versions) and want to take them to the next level, simply send me your crossovers and I can modify them for you.